SD Technologies promotes Domino white Ink Cartridges (825 ML) for all Domino inkjet printer users. We are one of the leading importers of consumables and spare parts for all inkjet printers. we supply at a nominal price. We are an accomplished organization which has gained name and fame in providing Domino UBK 651 Thermal Ink Cartridge to the customers. 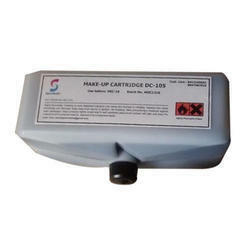 Makeup Cartridge compatible to Domino 261YL Yellow ink, White ink, Clear Ink etc. We are engaged in offering Domino Printer Cartridges. Our company has been successful in winning appreciation from the clients as one of the most prominent names in supply of Domino Printer Cartridges. We are amongst the most reputed names in the industry, offering Domino Ink Cartridge. Taking into account the increasing requirement of our clients we are delivering best series of Domino Ink Cartridge.